Well it's my turn to show you what I made for Stamping Dragons Card Challenge started last week which is to make an Easter card or project. I started off using Brocade Blue paper for my base which is a 6" square card. I used the collection by Authentique called 'Hope' for the rest. I added 3 layers and then cut out a frame using Spellbinders 'Opulent Ovals' using the 'Await II' paper. I then sponged the edges using Cape Cod Smooch ink. I then printed Jiggy Easter onto shimmery white paper and colored him using Prismacolor pencils. You can find him here in the store; Jiggy Easter I then used some funky glitter by Sparkle N Sprinkle to add some bling to the eggs, his ears and his headband. I then used a sticker from the same collection and then cut out a tag using bronze corrugated paper and a die from Magnolia called Vintage tag. I added some Baja Breeze seam binding along with a bow. I then took some white roses for I Am Roses and sprayed them using Whale Watch Blue Starburst spray by Lindy's Stamp Gang. Please note that we have changed the number of entries allowed per person. 2 entries is allowed per person. 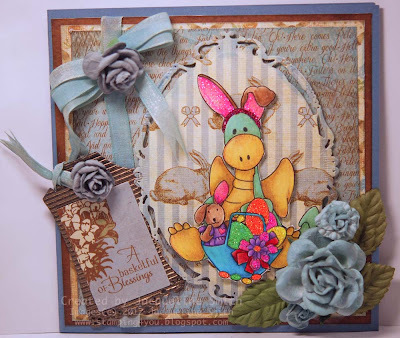 The group is for anyone wishing to get all the latest updates from The Stamping Dragon team. And do make sure to share all your Stamping Dragon creations with us..
Love the pastel blue background with the vibrant dragon. Great card Jacqueline! A dragon bunny - who woulda thunk it! Cute.